Yes, as is often the case as the season begins to wind down and move toward a climatic end just 4 episodes from now, there will inevitably be a filler episode. What is not inevitable, is that the episode will be as charming and enjoyable as this one was, the gruesomeness of the crime of the week notwithstanding. What else but filler, do you call it when 50% of the episode is the quest to re-home a cat? I was totally thrilled when we saw the promo pictures for this episode and saw that the adorable Mr. Pickles was going to be making another appearance but I never expected his story to take up so much of the episode. Nor did I expect that I’d enjoy it so much. I can’t remember the last time I laughed so much throughout an entire episode. Of course, we first met Mr. Pickles, along with Ricky Schiff in Episode 5.17 Kuka’awale (Stakeout). I always enjoy it when the writers (in this case David Wolkove & Matt Wheeler) bring back a story or a character from the past. I don’t know about anyone else, but it always makes me feel more connected to the show when I instantly recognize a reference from the past. It’s even better when it’s a character or a continuation of a story. “Stakeout” was a fan favorite episode because it was chock full of wonderful McDanno moments, something we haven’t gotten a great deal of lately. So, to have the opportunity to harken back to that great episode and to have great McDanno moments in this one as well was wonderful. Now let’s be honest. If any one of us got a phone call from a lawyer saying we’re unexpectedly named in someone’s will, who wouldn’t immediately dream of a windfall? We all do it every time we buy a lottery ticket. “Ohhhhhhh if I win, I’m going to……” It’s only natural. I loved that Danny’s first thought was retirement if his share was anywhere “north of $250,000”. I’m totally with you there Danny. That would be my first order of business if I came into that kind of money especially since I’m 16 years older than you! Steve, of course, is the more realistic one. When Agnes Miller bequeaths the bulk of her estate to the Humane Society, Danny is adorably disappointed so much so that Steve whips out his phone to save “the moment when all your dreams crashed down around you” for posterity. It really was very sweet that Agnes left Steve and Danny her beloved collection of cat miniatures. After all, she’d never actually met the guys, only knew about them because, obviously, someone (probably Ruth Tennenbaum (Cloris Leachman) told her, after the fact, about the stakeout in her apartment. She would, of course, immediately notice one of her precious figurines was damaged and lovingly repaired. So, who better to leave the set to then the people who cared enough to take care of them when they belonged to a total stranger? Technically she should have really left them to Steve alone but, of course, she wouldn’t have known which one of them had made the repair. It’s totally fitting that Steve be able to cash in on their collectability some day “fifteen or twenty years” from now when he’s ready to retire! I love the sound of that time frame. And who better than Ricky to leave Mr. Pickles with? He, after all, took care of Mr. Pickles whenever Agnes was away so she knew he’d be the perfect choice. Of course, Agnes didn’t know about the large pillow size bag of weed he kept stashed in her kitchen cabinet or his other illegal side businesses which would make him ill suited to keep Mr. Pickles. I loved the entire scene with Steve, Danny, Ricky and Mr. Pickles in the car and adored all the wonderful Steve and Danny, perfect McDanno time, throughout the episode. The bantering between them was perfect, both guys being totally true to character. I love that Danny got his comeuppance with regard to the cat figurines and that he took it extremely gracefully. All the “let’s find Mr. Pickles a new home” scenes were wonderful. The Steve and Danny banter, as well as, the lame excuses the others came up with for not being able to take him. Adam’s “allergies”, Junior’s “monogamous” relationship with Eddie and, my personal favorite, Tani’s fear of eventually turning into a crazy cat lady stuck at home watching Lifetime movies and wondering what happened to her life! And when Jerry said how cats can land on their feet from great heights, I loved how Steve covered Mr. Pickles’s ears and said not to give Danny any ideas! 🤣🤣 Of course Danny would never do something like that but his line about the windows not opening anyway was hysterical. Check out the way he lovingly stroked Mr. Pickles after he thought he found him a home. Cooing about how he doesn’t want to take him to the pound because bad things happen at the pound! Ricky is totally right. Danny is totally a closet cat lover!! This story was full on delightful from beginning to end except for the obligatory 30 second Rachel mention that seems to be standard operation procedure these days. Steve’s face when Danny said he couldn’t take the cat because Rachel is allergic was priceless and I’m sure pretty much all the rest of us had the exact same expression along with a hugely pronounced eye roll. So, Danny had to get rid of his cat when he married Rachel. Rachel’s move to Hawaii not only took Gracie away from him, causing him to have to leave the only home he’d ever known and his entire family, but he also lost his elderly dog to the quarantine process because of that move. Add custody battles, threats to deny him visitation and again, to take Grace away, having his child and lying about his paternity for years, not only denying Danny his son but taking a son away from Stan, etc. etc. etc. Oh yes, this woman is definitely a keeper. The one thing the Rachel mention did show was that Steve isn’t completely in the dark that something more is going on with Danny and Rachel. I highly doubt they’re living together again, but it’s obvious she’s spending a great deal of time at Danny’s if Mr. Pickles presence would cause a problem. Personally, I don’t think Danny is out and out lying to Steve but he’s keeping things close to the vest because maybe he, himself, isn’t really sure what’s going on, isn’t really sure what he’s feeling or what his next steps will be. Maybe he’s just trying to figure it all out and, eventually, he’ll go to Steve with a “Hey buddy… you got a minute? I really need your advice on something important.” Kind of like when Steve called Danny into his office because he didn’t know what he could do for Aunt Deb when he first found out she was sick. Anyway, powers that be… yes…. yes…. we get it….. we get where you’re trying to lead us. You really don’t need to throw in a reference every single solitary week. You know where you could throw in a reference every now and then? How about when the entire team has been working a case and the entire team is gearing up for the big take down and Danny simply disappears? How about a reference in there somewhere, huh? There is also this idea that leaped into my mind and, of course, this is complete speculation on my part. Maybe this Rachel thing is like the restaurant story. It seems pretty obvious now that the restaurant story was manufactured to give TPTB an out if Alex and/or Scott decided Season 8 was going to be their last. When both signed on for Season 9, the restaurant was scrapped. We haven’t seen it or even heard about it since Thanksgiving. It could be this Rachel/Danny reunion is exactly the same. It could be it’s being written as an out option in case Scott decides he’s had enough. But if he decides to come back for Season 10, it’s possible this story ends up on the scrap heap just like the restaurant did. There’s no way to know until it happens, one way or the other, of course. Anyway, I’m not letting that 30 second detour deter me from the fantastic enjoyment this episode provided, especially at the end. Watching Steve and Danny in Casa McG with Mr. Pickles and Eddie was golden. Of course, I wish there had been more Eddie because I never feel like we see him enough. But the comparison between Steve (as a dog) and Danny (as a cat) was hysterical. “And yet we somehow manage to get along”. At least, unlike Mr. Pickles, Danny has learned not to try to steal Steve’s food! Another wonderful scene was the one between Lou and Adam. I really liked how Lou felt he needed to check up on Adam after the tough time he’s had the last couple of years. I have to admit I felt this talk was a bit out of place since it didn’t correspond to anything else happening in the episode. But I loved the bonding moment between these two. My only guess about why this scene was included here is the need for us to be reminded that Adam is ok and that he’s found happiness with his new job and with his Ohana. But, we all know that happiness can’t be allowed to last very long on this show so it seems pretty obvious that there will probably be a change in the direction of Adam’s life coming sometime soon. And the final layer of delightfulness? Just how adorable was Tani asking Junior to be her “not” date at her friends wedding. I just can’t with these two. They are the epitome of cute! If we are destined to end this season with a coupling, please let it be these two. 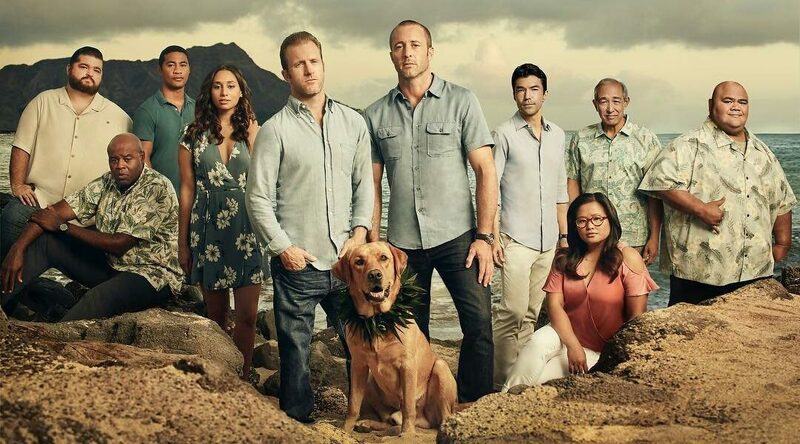 In this show, which reeks of dysfunctional relationships between the breakup of Adam and Kono, to Steve and Danny and their respective awful exes, Lou and Renee are the only ray of relationship sunshine. Please let #ReiRay be another ray! They are just too adorable to believe. Oh yeah, there was a crime of the week too. One which was book-ended in gruesomeness. The “before the wave” murder one of the most horrendous we’ve ever had on this show. Being burned alive in a crematorium. It was horrifying. Having the perpetrator blow his brains out rather than be taken in was grisly as well. The story in between was a bit uneven, but it was enjoyable enough. I didn’t really like the ending all that much and not just because of the way the bad guy killed himself. I thought we could have done without the brutal beat down or at least it didn’t need to be as brutal as it was. Normally that doesn’t bother me but this one seemed to go on just a bit too long. I also thought the way the dad smiled at his long-lost daughter and her little almost smile back was odd. She has no clue who this man is and the only father she’s ever known just killed himself in a standoff. I think it would have played better if they would have shown how traumatic that would be for her. But that’s just me. But it could very well be that I was enjoying all the Mr. Pickles fun too much to pay enough attention to the crime of the week. What can I say? I’m a sucker for a cuddly, purring lump of fur! Screen caps are mine unless otherwise noted and once again this week, huge thanks to @alohaspaceman. I seem to be stealing her wonderful creations more and more these days. I’m just thankful for how fantastic they are. Thanks Lisa! You rock! Hi Linda – your review hits on all the things I thought. Nice to finally see some Mcdanno and I agree – Steve knows Danny is getting into deep water with Rachel. The nasty in me thinks PL enjoys stirring up the fans, but your thought that it’s to do with contract negotiations is probably true. Choppy editing. Not the first time we’ve seen it – do they really think we’re not going to miss Danny if Steve’s suddenly driving around in the cami sans his partner or everyone (except D) is geared up for the takedown? The other thing that stood out as odd was that scene with Lou & Adam. You picked up on that too. It seemed out of place and with no new crisis (Adam’s doing just fine) not needed. Nice they’re connecting, but seriously. …..Lou was bordering on monolog mode. They could have put those precious minutes to better use…..like explaining why Danny wasn’t geared up. OK mini rant over – got my dose of S & D so I’m good. Yeah, I think that’s why I loved this episode so much. There was so much Steve and Danny time I made me smile constantly for the entire hour. I wish the writers were able to do it every single episode. Your crossword puzzle was perfect. It was a cute, filler episode. The banter between the boys was thoroughly enjoyable. And it’s a rare episode that we get to see all the cast including our beloved Eddie! The COTW was as gruesome as it was stupid. A good story needs a beginning, a middle and an end. Lots of things were missing from this story, including the story. But they can get a pass because the rest of the episode was delightful. I never laughed so hard as I did at the ending. Steve chasing after Eddie hollering to drop the cat! Hysterical. Something makes me think that Steve won’t begrudge Danny 1 or 2 of those figurines when,15/20 years down the road, retirement looms. I can’t believe there’s only 4 episodes left. I can already feel the depression and deprivation setting in! Have a good week and thanks for another great review! ROFL Stupid might be a bit harsh but yeah, it wasn’t the best laid out COTW. I don’t understand why the killer brought the father to his house. I mean, he had no problem with cooking the first guy why didn’t he just pop the father and dump him somewhere? What was the point of keeping him in the house? Hey Linda, I pretty much felt the same way regarding this episode. I loved the McDanno bromance moments and then to jump to a couple of scenes with Danny MIA. It left me questioning why he wasn’t there. The scene with Adam and Lou seemed to just be put in there to kill time; however,I hope it wasn’t there to foreshadow things to come. I’d hate to even say or think that someone tries to commit suicide based on their conversation. Just a thought. Oh wow, Linda, great review! What an episode…it had the Steve and Danny that I know many of us have missed. From the hysterical scene in the car to the hysterical scene on the couch and all the bits at the office with Mr. Pickles, etc. That’s the thing–we know they can still pull it off so why don’t they? As Carol said above, it seemed weird to have that Adam and Lou talk pop up out of nowhere, especially when that time could’ve been utilized better like including Danny…and then that scene could’ve been placed in another ep where it could make more sense. COTW–totally agree. That daughter had no idea she was kidnapped. Real life has shown us that even with kidnapped children, there’s a bond and a biological parent just popping up all of a sudden is a lot to handle–so yeah, that was not realistic at all. I do love your thought about why we keep getting these horrible little references to Rachel (and Danny)…as a tactic in case contracts fall through. At least there could still have a shot at seeing things cease and desist between these two. Sick of it, especially since we all remember their history. I keep hoping Danny will go to Steve as well to talk about it all and say something like, “Ya know, with Grace’s accident and all, we’ve started talking and it’s been nice. I remembered how it used to be and yeah, we’ve spent a lot of time together lately. But then…it’s been coming back to me. The lies, the pain, everything Rachel put me through and what we both lost. And I can’t do it, Steve. I can’t.” I can’t imagine he’d want to go down that road again. So I’ll hope that things work out and, in the meantime, they realize how many viewers watch the show for Steve and Danny. Not Danny and Rachel. The ending capped everything off…did anyone else think about the fact that Eddie going after the cat could be a metaphor for how Steve wants to shake some sense into Danny concerning this thing with Rachel? HA!! Oh I hope a scene just like the one you describe between Steve and Danny does happen because it’s perfect. It’s understandable after what happened with Grace and the time they’ve been spending together that Danny could be lulled into forgetting everything that’s happened before but he should, inevitably, get to a point where he just shakes himself and says “what the hell am I thinking”. That would be the perfect moment for him and Steve to have that kind of talk. Loved the episode. I wondered where Danny was. Unless he was back at the office with Mr. Peckles and the other guy. H50 fights always go on too long and the bad guy taking the first dad to see the guy that died, that is why he took him to the house. The girl look was, Who are you and where is my dad?. I don’t want Danny and Rachel, just don’t want it. I think as long Alex is in, Scott is in. I totally loved this episode. I loved all the Steve and Danny parts. Those two are great together. No one can deny that. And I didn’t mind the COTW either. It was somewhat intriguing. I loved when Tani asked Junior to go to the wedding with her. I love her and Junior together. Talk about a cute couple. That is a great metaphor, Steve wanting to shake some sense into Danny concerning the thing with Rachel. What ever happened to Melissa? She really loved Danny. I’m assuming they broke up. Well, it’s going to be whatever it’s going to be, but I’m hoping it doesn’t mean that Danny is leaving the series. I don’t know if I could still watch it without him. There is no one that could take his place. Great review, Linda! I agree with you about the Lou/Adam scene-although it was sweet to see them bonding, it really had no place in the scheme of things, if you know what I mean. The COTW was really strange-I didn’t understand why the killer took the real father to his house instead of killing him,as I really believe he wanted to do. I felt sorry for the girl-she had no clue that the man looking at her was her real father and the man who raised her as his daughter was dead. Talk about being confused! It was great to see Mr. Pickles again,although Eddie was not a very gracious host to him-I mean,Eddie considers Casa McG his territory and no cat will invade it if he can help it! My favorite part of the show, though,was Tani asking Junior to go with her to her friend’s wedding and his saying yes. They are so dang cute together! This is one relationship I definitely want to see flourish in a big way! Can’t believe there are only four more episodes left-this season has went by way too fast!